February 22nd, 2018 | Moving Tips, Packing Tips. If you’ve ever relocated, you know that moving just down the block or across the state can be exhausting. A long-distance move across the country poses its own challenges, including trying to get everything to your new home in one piece without breaking the bank. Luckily, you can take steps to ensure your belongings make it to their new home without investing a large budget. Here are a few tips to help you keep your cross-country moving costs under control. Ask for a referral. Ask friends and family members for recommendations. This can give you a head start on finding a dependable, reliable company. Determine your needs. Before you interview potential candidates, determine your needs. For example, when are you planning to move? Will you need the movers to pack or unpack the boxes? Determining your needs will help you narrow down your choices. Gather several estimates. Talk to at least three different moving companies in your area. Read the fine print. Read over the offers and contracts of each. Watch for hidden costs, such as storage or bulk item fees. Ensure you’re comparing apples-to-apples when reviewing the estimates, especially if cost is your bottom line. When in doubt, choose a company that is well-known in your area, established, and has better-than-average customer reviews. Since interstate moving costs are based on weight and miles traveled, the less you have to move, the less you likely will spend on moving-related costs, including the cost to hire a moving company and supplies. The best way to accomplish this is to declutter your entire home. Go through each room and determine what is essential and what you can throw out, sell or donate. You may find it difficult to part with certain items. As a rule, if you have not used, worn or even remembered an item existed in the last six months to one year, that item is not necessary. The only items that are excluded from this rule are seasonal, such as Christmas decorations or winter clothing. A simple way to sell items is to hold a yard sale or ask friends and family if they could find any of your unwanted items useful. If you decide to donate items, you may be able to claim a charitable deduction on your federal tax return. Create a supply list. A common mistake many homeowners make when moving is underestimating the number of supplies they will need, which creates unnecessary trips to the hardware or department store. Create a realistic list of items to pack the first time to help ensure you have everything you need right away. Use items from around the house. Get creative by repurposing items from around the house. For example, packing clothing inside suitcases, or store items inside the drawers of your dressers. Ask friends and family. Ask if your friends, family, neighbors, or coworkers have leftover packing supplies from their recent move. Misplacing packing supplies is another potential waste of money. Help prevent this by creating a moving kit inside a box or tote. Your belongings are in the moving van, and it’s time to make the trip across the country to your new home. If you have several kids or pets, the most cost-effective option may be to drive. 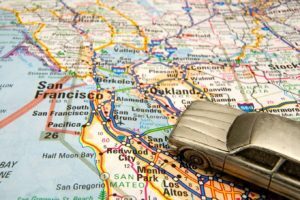 If you’re taking a road trip, you can save money during this adventure in several ways. For example, purchase plenty of snacks before the trip to avoid the temptation to buy chips, soda, or other goodies at the gas station. Instead of staying in hotels, consider turning your long-distance move into a camping experience. If you’re passing through places where friends and family live, take advantage of their generosity and ask to borrow an air mattress or couch for a night. However, if you are moving on your own or have no valuables or pets you want to keep close by, flying is often the most cost-effective option. From creating a packing supply kit to spending the night sleeping under the stars or on a friend’s pullout couch, you can save big money on your long-distance move in several ways. If you have any further questions or are planning to move in the near future, contact the professionals at Wheaton World Wide Moving.